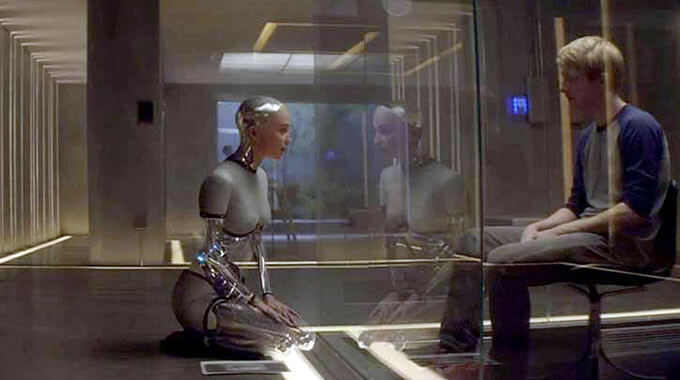 Ex Machina – Did You See That One? Caleb has been given a chance to take part in a groundbreaking artificial intelligence project with BlueBook CEO, Nathan (Isaac). Soon Caleb begins tested the breathtaking female A.I. known as Ava (Vikander). This science-fiction thriller came from the mind of Alex Garland (28 Days Later…), who both wrote and directed the film. This was Garland’s directorial debut, and has been met with praise from many major media outlets. The movie stars Domhnall Gleeson (Harry Potter and the Deathly Hallows – Part II), Oscar Isaac (A Most Violent Year), and Alicia Vikander (Testament of Youth). This story is built on an excellent science-fiction foundation that quickly begins to add layers of suspense and intrigue. The premise is simple, but features the right twists to keep it from being predictable. At first glance there are some obvious predictions to be made, and thankfully they’re all misleading. The result is a story that builds nicely and pays off in the end. The lack of predictability really brings this to a higher level. The characters in this movie are also really great. Each one of the three main characters has their own unique and intense arc. The dialogue throughout the film is used to help build the suspense without ever being too on-the-nose. Overall, this might be one of the best science-fiction thrillers in recent memory. The small and talented cast of this movie really do great work with the material. Oscar Isaac has a natural intensity that really plays well with his reclusive genius role in the movie. He’s instantly repulsive and interesting all at once. This combination keeps his real motives nicely hidden from view, and helps bring strength to the payoffs. He’s also got a unique chemistry with Domhnall Gleeson. Throughout their scenes together he does a great job playing an alpha male role. This is countered by Gleeson’s great performance as the uncomfortable but curious young programmer. Adding another great layer to this unique trio is the performance of Alicia Vikander. She plays her role with a childlike innocence that seems to hide something far more complex under the surface. She’s also able to connect well with Gleeson in some of the more interesting moments of the movie. Overall, these three actors do great work. This movie looks amazing. The CGI and special effects go a long way to add authenticity to the story. This is a film where the visuals are essential to the success of the movie, and they succeed nicely. In addition to the CGI, the set designs, and costuming also add nice layers to this one. Cinematographer Rob Hardy (Blitz) did great work on this one as well. Overall, the film looks and sounds great. If you’re a fan of science-fiction this has a lot to offer. I would also suggest this to fans of suspense. As a thriller this works wonderfully with the science-fiction elements. For fans of Gleeson, Isaac, and Vikander; this is one you should check out. With all of the elements coming together, this has a lot to offer. The visuals can get intense, as can the language, so this is not one for the kids. I give this one 5 out of 5 stars. Pingback: Star Wars: The Force Awakens | Did You See That One? Pingback: Jason Bourne | Did You See That One? Pingback: Annihilation – Did You See That One?